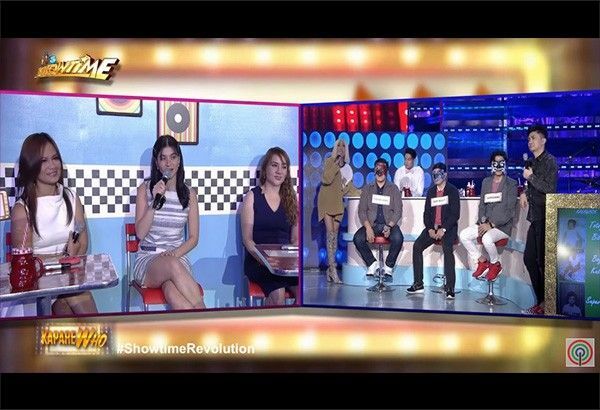 Scene from the "Kapare Who" segment of "It's Showtime"
MANILA, Philippines — Indonesia’s MNC TV announced that the TV station will be airing its own version of ABS-CBN’s hit noontime show “It’s Showtime” soon. To announce the franchise, MNC TV’s Facebook page posted a lyric video of the Kapamilya noontime show. “IT'S SHOWTIME INDONESIA SOON ON MNCTV! The newest and definitely exciting program will be on MNCTV! Curious about what fun and excitement is like? #ItsShowtimeIndonesia SOON on MNCTV,” the TV network said in Bahasa. "It's Showtime" Business Unit Head Peter Edward Dizon confirmed the news by sharing the video posted by MNCTV on his Facebook page. “HELLO THERE It's Showtime Indonesia. Congrats Team Showtime!” he wrote. The noontime show’s hosts Vhong Navarro and Vice Ganda also announced the news in the “Bidaman” segment of the noontime show last Saturday. “It’s Showtime” is not the first Filipino noontime show to be franchised by an Indonesian media company. In 2012, the show’s timeslot rival, “Eat Bulaga!,” was also franchised by an Indonesian company. The Indonesian “Eat Bulaga!,” however, only lasted for two years.